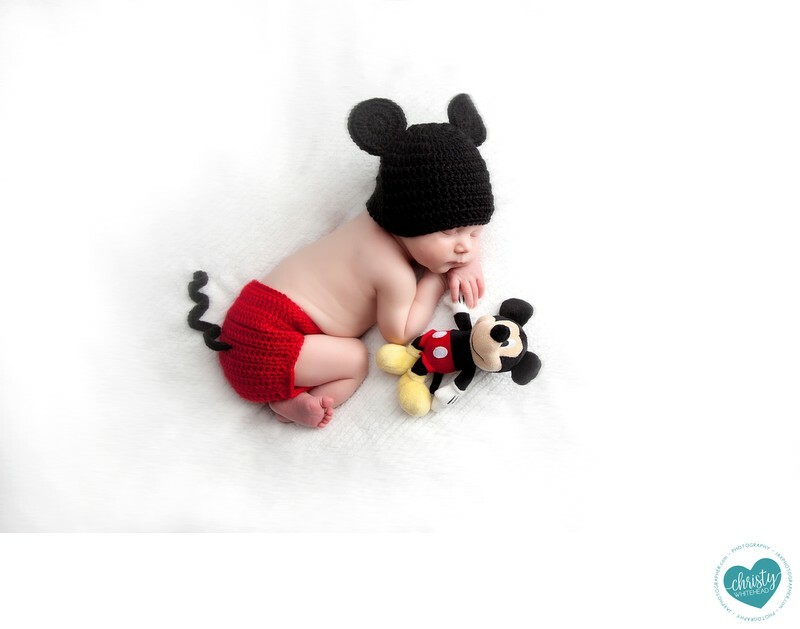 Mickey Mouse Newborn Holding Mickey's Hand JAX Florida - Newborn Photography | Schedule Your Newborn Shoot Today! We get lots of Disney fans. Mickey is popular. This little Mickey outfit, momma brought with her, but I do have a Mickey and a Minnie crocheted outfit in studio. The little Mickey doll is mine as well. I also have a small Minnie and a large Mickey Mouse we sometimes use. Some people love props, some want simple and clean. Have you ever thought about adding props to your portrait session? Props can add interest, depth and an extra panache to your pictures. Whether its flowers in a portrait of your children at spring time or sea shells at the beach for summer portraits. Love sports? Then use baseball bats in your next family photo to bring out your passion. Here are a few tips for ways to incorporate props in your next photo session. 2.Be realistic. Some themes are going to be easier to reproduce than others. What’s your budget? Can you reuse any of the items in your own home? It’s easy to go wild when thinking of a theme for your photo session. If you want to use seasonal props, try and buy them in that season (say Christmas) as they’ll be easier to find. Outfits can sometimes be difficult to find in different sizes as well. 3.Size matters. There are some larger props that work really well in portrait sessions such as using your grandfather's tractor as part of the background or to sit the kids and family on. However, a formal portrait, with everyone dressed to the nines might not work with the tractor, no matter how sentimental it is to you. Sometimes large props can take away from the beauty of the photograph altogether. Make sure that your prop enhances the photo and doesn't detract from it. 4.Make it meaningful. If your child has a favorite toy or pet or if you son lovest to play the trumpet, let’s try and incorporate it into your photos. This way your pictures will have more meaning to you and your family. 5.Use what you have. Make the current season work to your advantage by using what’s available. Leaves in the fall make for amazing props in photos and don’t cost a thing. Remember, using props can be the perfect addition to your photos but make sure that they don’t deter the attention away from the true main focus—your family.